The Fiat Ducato, with its clean lines and easily transformable cargo space, is an ideal van to convert into a workshop on wheels. 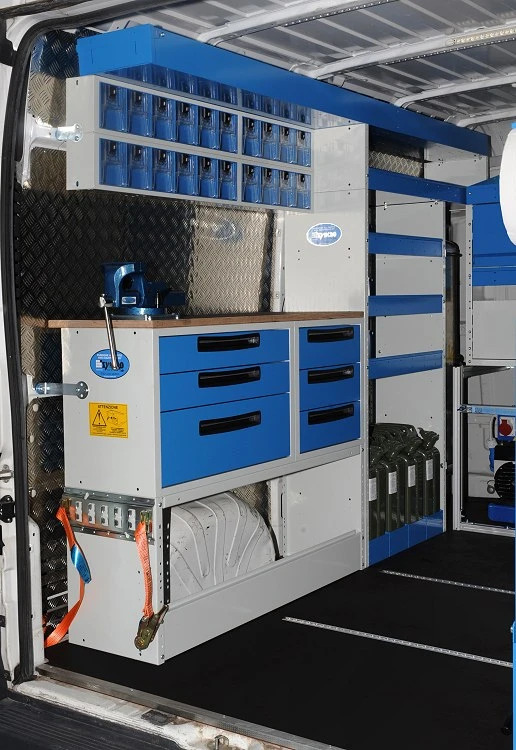 Thanks to the modularity of Syncro pieces, it is possible to create the type of upfit that lets you work on your van anywhere – whether working on outdoor industrial units or on large machinery, your fully functional mobile workshop can go wherever it is needed. 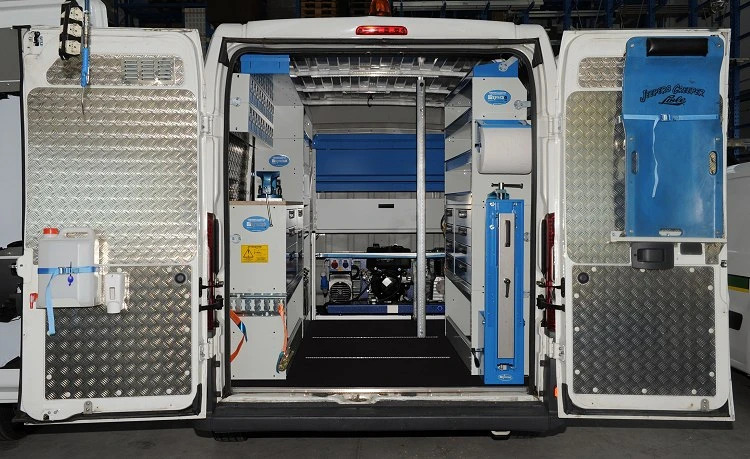 On this page, we see a classic example of a mobile workshop installed on a Fiat Ducato L2 H2, made even more efficient by the addition of a powerful generator/compressor. Let’s start with the basics: like all expert upfits, this one begins with a solid floor. For this Ducato, we installed a 12 mm resin-coated plywood floor panel with recessed steel anchorage points for tying down cargo, and steel anti-slip borders along the edges corresponding to the van doors. The floor panel was specially fitted for two aluminum tracks used to lock Syncro load lock bars in place - a perfect solution for securing even very heavy cargo. The cargo van walls have been protected by extremely durable chequered plate aluminum paneling. Like all Syncro paneling, this too was precision cut by lasers, guaranteeing a perfect fit for the Ducato. Floor, wall and door paneling serve the dual purpose of protecting the original van interior surfaces from everyday wear and tear, as well as creating a solid foundation for the racking components and accessories. Moving on to the racking units mounted on this Ducato, we installed a durable worktop with a steel vise, allowing workers to carry out jobs efficiently on board the van. The workspace consists of an open wheel arch base frame, that can be used as extra storage, and two drawer units with steel drawers mounted on telescoping ball-bearing glides, complete with individual automatic locking mechanisms. Above the drawer units, we mounted a workman-tough 25 mm resin-coated plywood worktop, including a 125 mm vise with forged steel pipe jaws and rotating base. Over that, we placed a metal drawer unit with 20 clear plastic drawers, each with an individual automatic locking mechanism. The transparent drawers are extremely practical, allowing workers to quickly see and retrieve items. Thanks to the patented locking system, drawers automatically lock shut when closed. Along the bottom right-hand side, there is shelving space for safely storing and transporting the four 20 litre gas cans (each with a transport bracket) needed for the generator. Above the gas can storage compartment, there are four shelves with dividers and mats. The very top extra-long storage shelf extends the length of the cargo space for convenient storage and transport of elongated items like rods, tubes and pipes. The right-hand side upfit starts with another open wheel arch base, then two more drawer units with a total of eight steel drawers. There are also four shelves that all come with dividers and rubber mats. 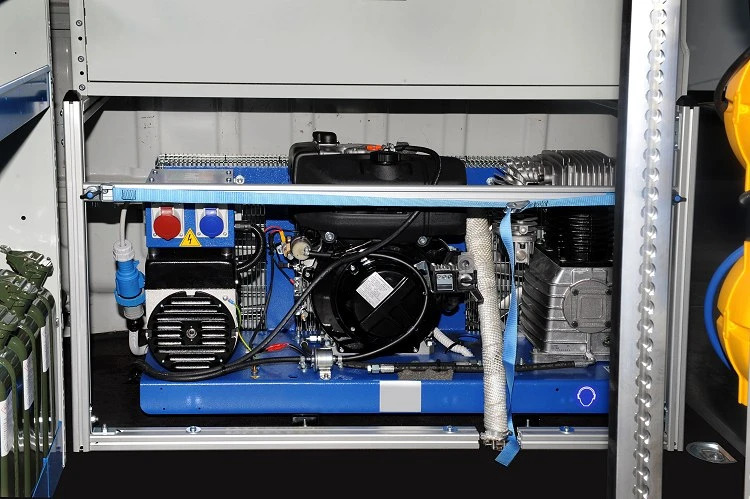 Along the bulkhead, we mounted a steel frame that houses the powerful generator/compressor, and creates a base for further racking components, including a large closed shelf equipped with the patented open-wide door panel that opens using an innovative rotating sliding system. Above this still, is another closed shelf with hinged front panel. At the top, there is a final open shelf. 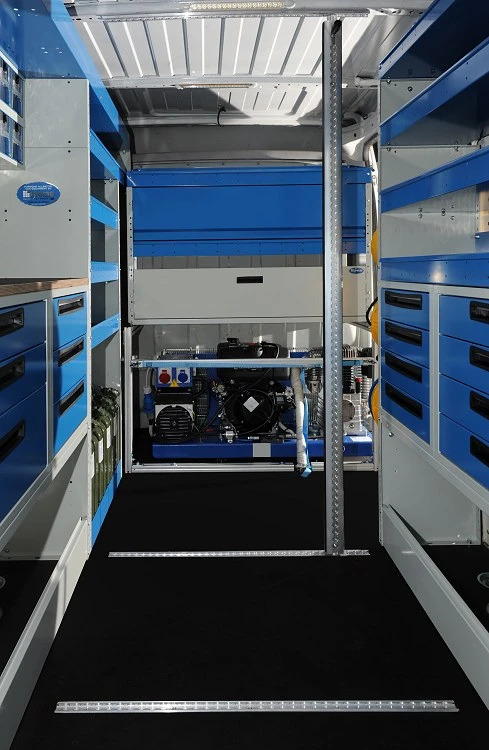 The mobile workshops upfitted by Syncro have a large variety of accessories that make work easier and more efficient. For this upfit, we mounted several useful accessories. Fixed to the left back door, is the hand washing kit consisting of a 10 litre water tank with spout and soap dispenser. To the right back door, we mounted an aluminum fixture with strap and clip for creeper storage and transport. On the left-hand side (with easy access from outside the back of the van) is a combo track, strap and clasp that can secure up to 4,000 kg of materials and equipment. On the opposite side, we mounted a folding workbench/vise mount, complete with a second vise exactly the same as the one mounted to the work station – creating maximum versatility for working either inside or outside the van. Just above the folding workbench is a convenient paper towel roll holder for 280 mm paper towels. 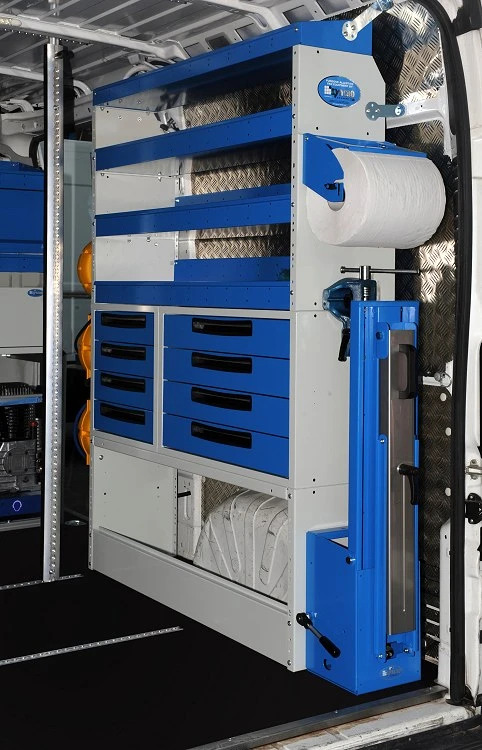 In the pictures, you can also see a rubber-coated load lock bar in notched aluminum, mounted vertically between the tracks fixed to the ceiling and floor of the Ducato. The bar/s can be mounted anywhere along the tracks and can be repositioned or removed in just seconds. Another smaller aluminum track and strap secure system was fixed to the front of the frame housing the generator/compressor. Let’s not forget the lighting – workers are guaranteed bright lighting, thanks to two powerful and energy efficient LED ceiling lights. But the highlight of this upfit just might be the generator/compressor. 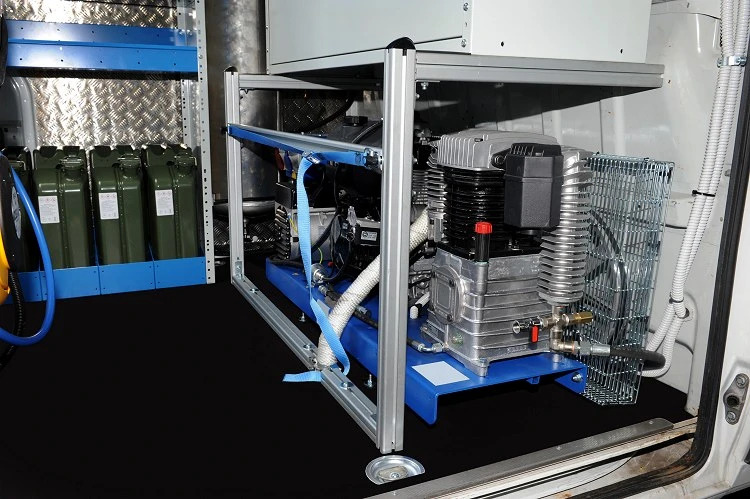 This unit is designed specifically for vans – with a diesel engine, 380 V from 6.2 KVA and 10 bar 830 litres/min compressor. 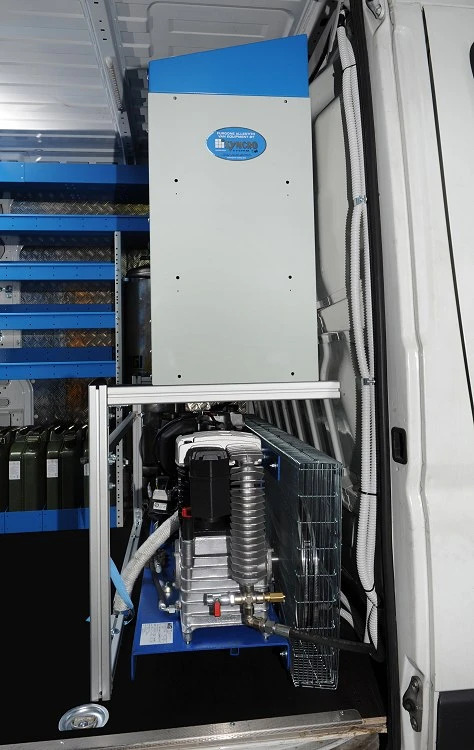 The electricity and compressed air produced can be used on the van or some distance from it. Mounted to the right-hand racking unit is an electrical panel complete with sockets, circuit breaker, three extension cord reels, electrical outlet and a compressed air hose reel. 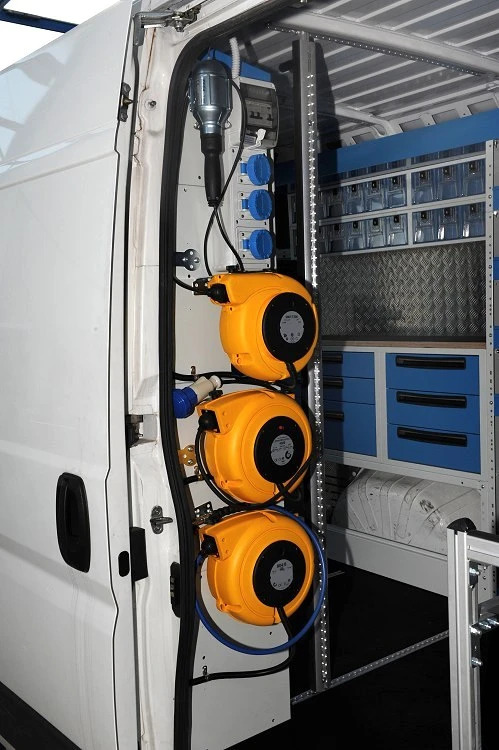 This upfit shows how it is possible – by meticulously using every millimeter of space – to create versatile and effective conversion solutions for your working van. A fully functional upfit like this one allows you to work on site just as efficiently as you would in any shop.